Year after year, new introductions take place in the peony world. My Peony, however, knows its classics and Boule de Neige is definitely one of them. The flower has an off-white color with a red line running through it. The flowers are completely double, the stems dark in color and strong. This peony has a stunning, big flower bud comparable to the Sarah Bernhardt peony. Nobody knows how old Boule de Neige is, nor exactly where she comes from. According to ‘grandfather’ Lammert, she was already peaking when he started breeding peonies almost 70 years ago. 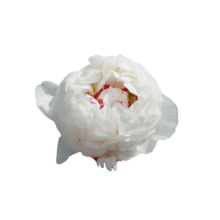 In his time, the peony was called ‘The White Sarah Bernhardt ‘. Not an odd comparison, because the peony are striking similar. Both bloom late in the season, have a big flower bud and smell fantastic. Boule de Neige has almost been lost due to cultivation changes and innovations in the assortment. Only some of our growers still have it in their assortment and therefore they become special and exclusive.